Ok, so here’s the thing, we (the family that owns Eco-Bags) is a family of walkers and bikers and it definitely influences other choices and how we see things. I walk to work almost every day. It’s an easy walk, about a mile+ and mostly downhill. I have to walk anyway because I have a dog, that needs to walk. I rarely see anyone else walking except for kids walking to a school bus. I’m in the suburbs. Blake usually walks about 6 miles every day…to metro north from home, from the train to school (he’s a teacher) and then her reverses it. BTW, it’s a lot of hills! 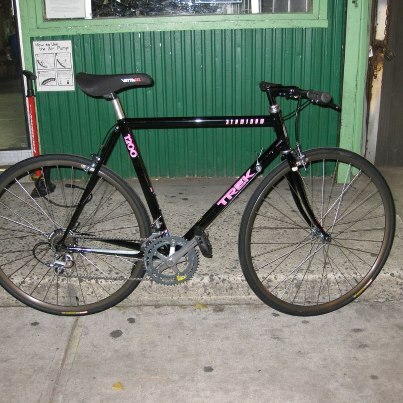 Julian, an artist, lives in Brooklyn and bikes everywhere and hardly uses mass transportation. When everyone was out of power and held at bay at home, he was tooling around the city, and able to help out folks who needed assistance cleaning up their places with water damage. When Hurricane Sandy was done, thousands of people took to the streets and started walking. Lots of bikes got pulled out basements and fixed up. Recycle a Bicycle got really busy…. What does walking and biking do? Obviously, it’s good exercise for your body but there are healthy mind benefits, too. It’s an unfettered commute where thoughts aren’t colliding with other things except maybe your own thoughts and, you get to see the weather change. Climate Ride California is On! Last May I had an amazing opportunity to ride my bike in the Climate Ride. I wrote all about it in a blog post. Right now, there’s another Climate Ride happening in California…from September 9-13. Hundreds of cyclists are challenging their bodies (lots of big hills) and their minds (great speakers like David Arkin of Arkin- Tilt Architecture) with a like minded group down the coast of CA. The Climate Rides have raised $863,000.00 to date, for advocacy groups like the Solar Living Institute, and the Active Transportation Alliance and other groups involved in climate change issues. While I couldn’t do the California ride, I am following the blog. This morning I gave my own personal shout out from my spinning bike at the gym. There are so many reasons to ride. If you’re riding you’re probably not reading this blog but for the rest of us…maybe you’re considering doing the next ride?? In honor of the California Climate Ride, and to get you thinking about possibly joining the next ride, tell me about your favorite non-profit /charity ride-run-walk event? To leave your answer, send ECOBAGS a tweet or post on our Facebook wall. 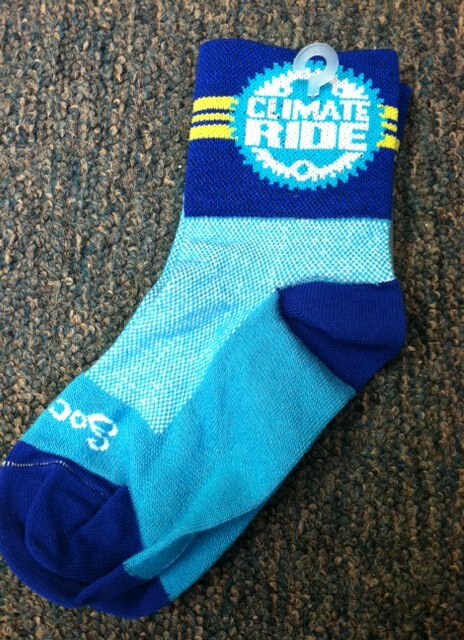 I happen to have two pairs of Climate Ride cycling socks that I’d like to give away along with a Classic ECOBAGS String Bag. The give – away will go from 9/12 – 9/14. Two lucky people who tweet or post on FB will get the socks so they can start dreaming about riding their bikes 300+ miles for change.